Theory, power plant visits and exchange of experience were the focus of the flexibility training for ten Indian power experts. 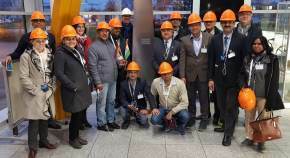 The training was organized jointly by the KWS PowerTech Training Centre, the Indian Excellence Enhancement Centre and the VGB PowerTech on behalf of the German GIZ. The Indian group consisted of representatives of power plant operators and the Ministry of Power and its associated institutions. The training was conducted under the auspices of the Indo-German Energy Forum (IGEF). Training for Indian power plant operators is an important field of action for the IGEF in order to enable the flexible operation of coal-fired power plants. Improving energy efficiency is one of the pillars of the European Energy Transition. The execution of energy audits or the implementation of an energy management system according to ISO 50001(revised in 2018) is placing a variety of questions and challenges to the VGB members in the energy industry. VGB tackles the experience exchange on legal and technical aspects as well as energy audits and energy management systems. The Project Group Energy Efficiency Helping VGB members to take advantage of energy efficiency has been established in June 2017. The group is still looking for new members to improve the knowledge base which should be based on the largest possible number of members from different countries. Technical basis for future connection of generation plants to the extra-high voltage grid: NetworkCode RfG and German VDE-AR 4130 – deadline is expiring on 27 April 2019! Commission Regulation (EU) 2016/631 of 14 April 2016 establishing a network code on requirements for grid connection for generators (NC RfG) is the legal basis for the future connection of generation plants to the grid. The VGB Project Group Network Codes has critically and constructively supported the European process and continues its work in the relevant European committees to discuss implementation issues and point out possible solutions. VGB is represented as an official partner with voting power in the European Stakeholder Committees for "Grid Connection" and "Operation" and is involved in the temporary Expert Groups committed to the interests of the generating companies. The deadlines for the introduction of NC RfG and VDE-AR-N-4130 are expiring on 27 April 2019. Thereafter all new plants have to fulfill the new requirements. The definition of existing plants and the impact on existing plants is fixed within the European framework at national level. For the German implementation further details regarding existing plants and the extensive VGB activities are described. 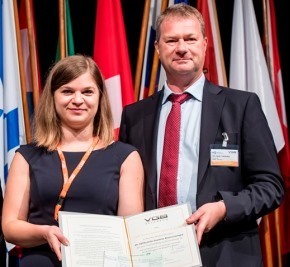 The VGB Research Foundation awarded the VGB Innovation Award 2018 to Dr Efthymia Ioanna Koytsoumpa (32) for her investigations on energy storage technologies in power plants. Results of her work are presented under the title Renewable substitute natural gas synthesis integrated in power and gasification plants for energy storage in the VGB PowerTech Journal 12/2018. Download of the article is free of charge. The Technical Group Performance Indicators celebrates its 50th anniversary this year. It is a golden oldie among the VGB committees. Besides always up-to-date tasks in the field of availability and reliability indicator of plants and components for power generation and storage, the members from about ten European countries look back on challenging times and are full of energy for the future. In recent years, networking with other VGB committees is a trend carrying out joint special projects. All of these have in common that the TG Performance Indicators contributes prrecise terms, and methodological and IT experience. In cooperation with experts of the Strategic Forum Wind, damages of main components are compiled. The target is for example to establish reliability indicators. This enables to check guarantees or maintenance contracts as well as to optimise the spare parts stock. In cooperation with the TC Materials and Quality Assurance data of the power plant information system (KISSY) are analysed with focus on increased wear of components due flexible operation of conventional power plants. More frequent starts and load changes lead to shorter service lives, especially for thick-walled components such as live steam pipes or turbine and valve housings. Aim of the investigation is and optimisation of measurements. Jointly with the TG Reference Designation and Plant Documentation, a group is working on software enabling maintenance and joint use of designation systems. Aim is to reduce the maintenance effort for different designation systems, such as RDS-PP and KKS, and to gain synergy effects for the KISSY database. 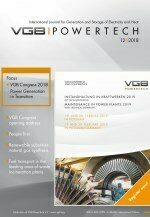 The VGB Job Market is offering prospective persons the possibility to develop their career in power and heat generation. You can find current vacancies on our homepage. Safety & Health – Something new old? Also in 2019 the VGB PowerTech Journal will continue to provide current information and latest news and findings about the trends in the power business. Make advantage of our renowned journal and print advertising and address your customers and stakeholders to draw the attention to your products and services. The focal issues and deadlines are listed in our editorial schedule supporting decision when to place your advertisement for the maximum yield. Get in touch with us, we would be pleased to make a bespoke offer to increase and improve your market position.